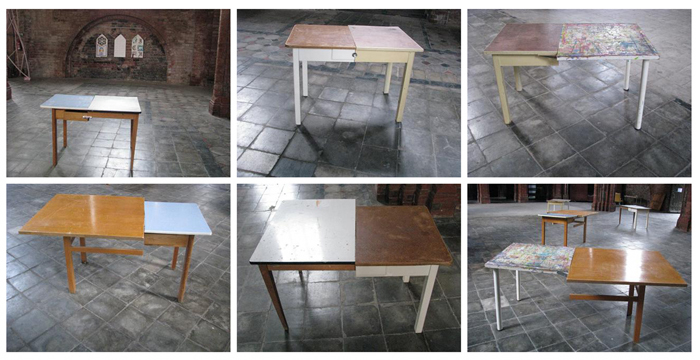 Eva Fahle-Clouts will be showing 4 Oder/Main/Tables, which she created together with David Rogers 2010 in the Peace Church in Frankfurt Oder. The installation commemorates the 20th anniversary of German reunification. The tables were exhibited in Frankfurt Main Zeil 2011 and in Frankfurt-Höchst 2012. Two of the tables are still in Frankfurt Main, were one will stay, the other will be transported to Frankfurt Oder in April. Review of the 3 year project and its future associated events. Installation of tables, projection, sound and photographs. with a live broadcast on DIVAcontemporary Radio (details to be announced). As part of the exhibition: Oder/Main/Tische at DIVAcontemporary in Bridport Eva Fahle-Clouts has invited two special guests, Carina Stokes and Eric Harwood, to talk about I D E N T I T Y.
Carina Stokes is a counsellor who lives and works in Bridport. She is originally from Sweden and has lived in several different countries and cultures. She will present her personal views on identity coloured by her rich life and work experience. Eric Harwood is a TV producer who lives in Charmouth and works internationally. Eva Fahle-Clouts will present some of her personal experience which has coloured her identity and her point of view. Then there will be an opportunity for discussion.